The grey foggy day of London's reputation has been with us most of the week. 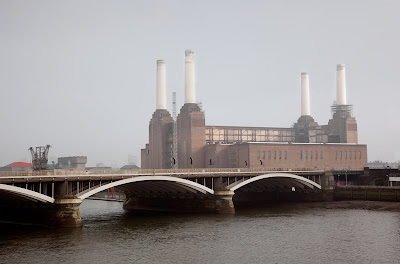 Imagine how it would have been however when the Battersea power station was still working. I remember what it was like!!! Still makes for a great shot, Mo. Smokey? It looks like an overturned coffee table with the legs poking up. Surely not like a power station? Great shot of an industrial landscape! Would we be seeing smoke coming from all four of those stacks? I can imagine the filthy smoke pouring out of each of those chimneys, hanging in the air creating a dense layer of mucky grey smog! It is a nice photograph. Without those old base load electric generating plants, I haven't figured out how the lights in London still go on when a switch is flipped. What is it used for now? Quite an iconic building. Lovely photo! But then any photo with the Battersea Power Station is going to be a winner in my opinion.